*For safety reasons and developmental appropriateness, children outside of the class designated age group cannot attend. Wiggle & Grow (Level 2). Ages 2-3 years and a caregiver. 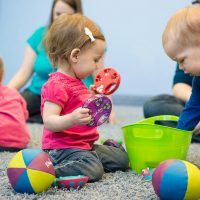 Each week your child will love singing, dancing, and playing instruments with you and new friends and you’ll love helping practice a wide variety of abilities such as gross and fine motor skills, turn-taking, social skills, story time and active listening. In class, we’ll also share tips and ideas for using music throughout the week. Plus, the fun (and learning!) 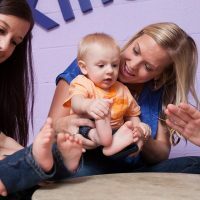 continue with the Kindermusik@Home digital home materials, including music from class, musical activities, and a story. Limited to 12 children and their caregivers. Access to @Home digital home materials is included in the registration cost. Shelley Buisson instructs. For more information call 919-449-8586 or email MusicInMeNC@gmail.com. 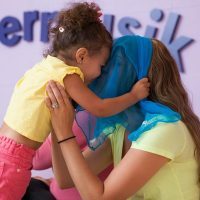 Two 8–week sessions – 4 months of Kindermusik fun!